Downtown Memphis is awesome. This is definitely not the first time I've said this, and it certainly won't be the last but there's always something going on that makes me stop and say "man, I love my nieighborhood"
Down by the Mississippi River there's a relatively new building called Beale Street Landing. They built it to make it look like it has always been there, a natural piece of the bluff. The roof of Beale Street Landing is more than just, well, a roof. They covered it with grass to allow people to jog or walk their dogs along it. It also makes a great movie theater. 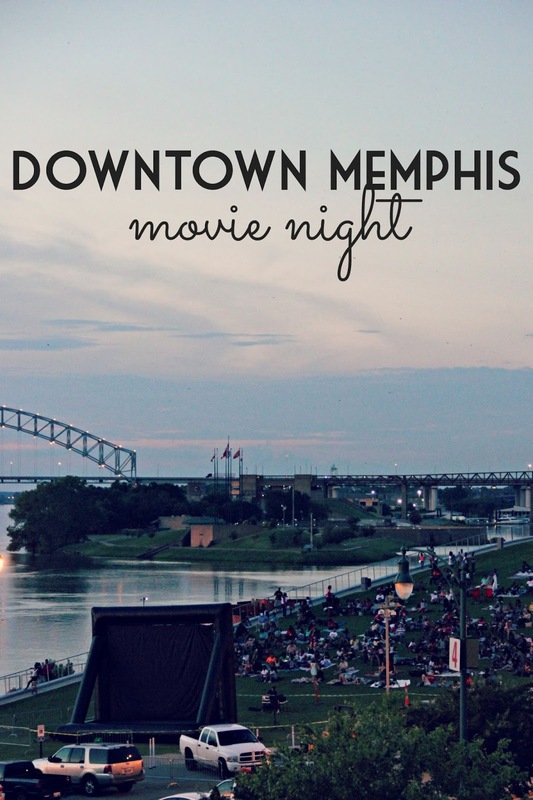 On Tuesday nights in the summer you can go down to Beale Street Landing for free and watch some pretty great movies. This week, we went to see Frozen. Yes, Frozen. The sad news? Summer is almost over and there are only two movies left!! You can watch The Princess Bride on July 28th and Indiana Jones & the Last Crusade on August 4th. Both movies begin at 8:30. Bring the family, but leave your pets and coolers at home. Between the Riverfront Bar & Grill and the food trucks, you shouldn't be hungry. PS. You might also want to bring some bug spray. I SO want to do this! We just haven't had a chance because Tuesday nights aren't always good for us. It's such a cool place to have an outdoor movie set up though. Love the photo. It sounds awesome! Wait, that's a building? Wow, that's pretty awesome. You can't even tell. There's something similar in Dallas but it's over the freeway. A park with fountains, food trucks and they have tons of events. You'd never know that there's a freeway underneath you. Great way to develop fun space. PS. You might also want to bring some bug spray.... And also be sure to bring your bulletproof vest and take your pistol. Remember you live in the 3rd most violent city in the country. Nearly as bad as Chicago. Just read the Commercial Appeal daily.